Cold Nights, Warm Homes. Guaranteed Comfort. The Hudson Valley is no stranger to bitterly cold winters that can chill you to the bone. When it’s cold outside, you rely on your boiler system to keep you safe and warm. If your boiler stops working, it can not only be uncomfortable – but also very stressful. When disaster strikes, you can rely on the professionals at T.Webber to resolve your heating issue with honesty and integrity. T.Webber has been providing expert boiler service, repair & installation throughout the Hudson Valley for 30 years. A+ rated by the BBB, T.Webber is known throughout the area for our high-caliber technical work and customer-focused service. Our Boiler Experts can service, repair and install all makes and models of boiler systems – gas boilers, oil boilers, and steam boilers. Got an issue? We can help. 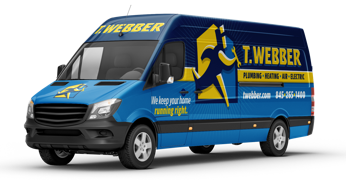 From recommended seasonal maintenance to required repairs, T.Webber can handle all of your boiler needs. Our fully stocked “warehouse on wheels” allow us to bring our business to your doorstep and complete most repairs same day – ensuring your comfort is restored quickly and effectively. If your boiler is older than 15 years, it may be approaching end of life and it might be time to consider a replacement. Think about it—in the decades since your trusty, old boiler was installed, the technology has grown by leaps and bounds. Modern boilers are smaller, quieter, higher performing and more energy efficient than ever before. This means a new system can help keep you more comfortable – and save you energy and money. T.Webber offers complimentary consultations on new-system installations. Our Heating Experts can recommend the perfect boiler for your home’s specific needs. And with low and no interest financing, a new heating system may be even easier to afford than ever before. What are you waiting for? Let T.Webber help take the hassle out of your heating system. Our staff if available 24/7 to ensure your home and family are kept warm even on the coldest days. Our big blue trucks are already in your neighborhood!